Welcome to another edition of Ask Sentai! Are you guys gonna release the full Chaika cast list soon? I love the main characters so far! Favorite Akame Ga Kill episode? I may catch a TON of flak for this, but it's probably the episode where Esdeath and Tatsumi are stuck on a (not so) deserted island. Kinda lets you see a different side of the General than what you're used to, it was a pleasant surprise. Is Gate coming back for a second seasonif yes when and is it going to be dubbed or on dvd soon? 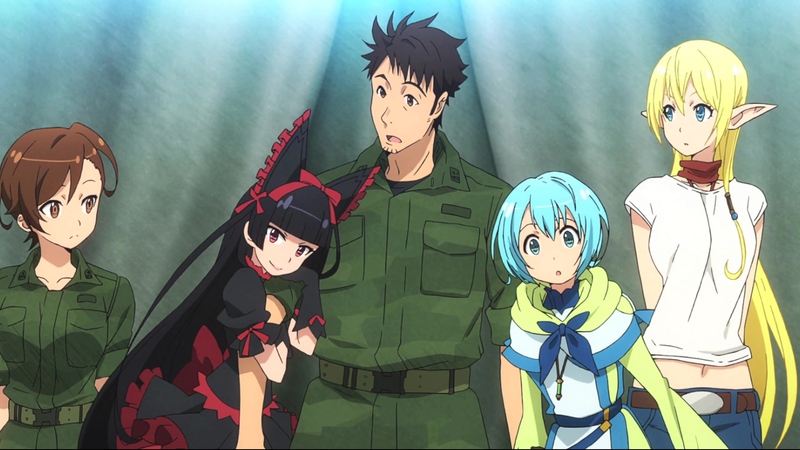 What's the likelihood of Gate getting a collectors edition and or dub? Also will we see a Log Horizon 2 dub sometime soon? A ton of factors go into deciding that, and it depends on how it does during the simulcast period. Certainly that's not the only factor, or a deciding factor, but it is just as important as the rest in figuring out whether something qualifies for a CE. I would say it has a pretty good chance at a dub, it certainly is popular enough. Unfortunately, I don't make those kinds of decisions, I am but a vessel for the voice of the people. You guys sure are loud about it though! Makes my job easier when you are. I've been following you on Twitter since you officially came back from hiatus in 2013, so I know that whoever runs the Sentai social media accounts is an actual fan, not some desk jockey. As a fan, what upcoming show are you the most excited about releasing? Thanks! Oh, I even remember the day when we came back to social media, it was very satisfying to let people know we were going to be active again. Hopefully we have lived up to expectations so far. As a fan, I am desperately awaiting the Monthly Girls' Nozaki-kun release. It was one of my favorite shows of the past few years, and when I heard we were dubbing it I was simply over the moon. I would also like to thank everyone who has requested a CE for Nozaki on our social channels (there have been a TON of requests), makes me look a little less crazy when I ask about it as well around here haha. Anyway, yes definitely Nozaki. Are you doing any more giveaways this year? We are, actually! Holidays are a great time to run fun little giveaways, and judging from the entries into our Bounty Basket Giveaway, you guys love them too. Right now we are judging the turkey hands submitted, but we do have something going on in December as well, just haven't announced it yet. What's the prize? It's a doozy. I pre oredered Akame ga Kill box 1, do you have a date set for box 2? Any idea when we can expect Parasite on Blu-ray? Will it get the CE treatment like Akame? Parasyte is definitely coming to Blu-ray, as far as when...I couldn't really say with accuracy. HOWEVER! Seeing as how it's on Toonami and gaining popularity as more episodes are broadcast (shoutouts to toonamifaithful.com for those delicious weekend numbers! ), I can definitely see us announcing something soon. Pretty sure we're not sitting on this one, gotta strike while that fire's hot! When will you be releasing Higurashi S1? I can't really say YET, but from what I saw in checking our release calendar, it's finally found a home. Of course, release calendars are subject to change at any time, but just the fact that it has an unofficial date attached to it means that it is closer to releasing than not. So cross your fingers that it doesn't start to grow legs! That's it for this week! Next time we'll talk about why Susanoo from Akame ga Kill! is best girl. Shut up, he totally is. monthly girls' nozaki-kun monthly girls' nozaki=kun is it wrong to try to pick up girls in a dungeon? gate when they cry higurashi danmachi nozakikun nozaki nozaki-kun gekkan shoujo nozaki-kun gugure! kokkuri-san parasyte chaika coffin princess chaika chaika the coffin princess akame ga kill!